It was time for red meat. 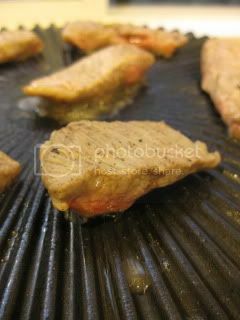 I got beef tri-tip meat and sliced for table-top grilling on our authentic Iga-yaki Grill, "Yaki Yaki San". 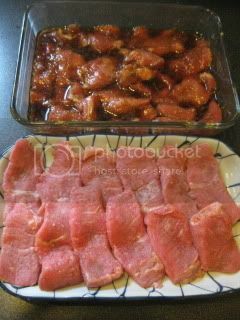 I seasoned half of the slices simply with salt and pepper, and for other half, I marinated in soy-based marinade (grated ginger, grated garlic, 1T sake, 1T honey, 3T soy sauce, 1T sesame oil) for a couple of hours. Yaki Yaki San was set on a portable gas burner at the dining table. 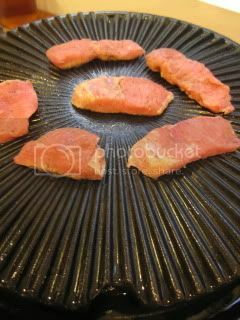 Once the grill was ready, we started with the non-marinated meat first. 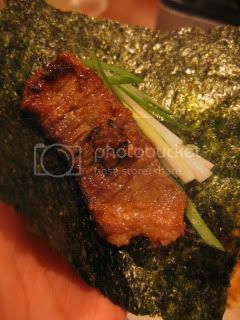 I love that Yaki Yaki San releases no smoke or very little during cooking. So, I never need to worry about the room becoming smoky. Also, to me, the way Yaki Yaki San cooks meat is quite spiritual...it's quite calm and almost like the meat is meditating. 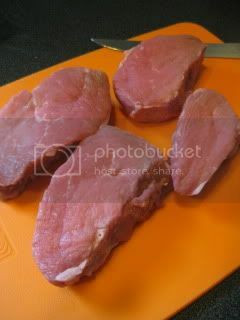 And, when the meat is ready, it's cooked evenly and tastes juicy and so flavorful. I tried some pieces with Ume-shichimi (plum-flavored 7-spice paste) from Fukuoka, Japan. Delicious. No wonder there are many Yaki Yaki San fans among restaurants in Japan and they have menu for cooking with Yaki Yaki San. 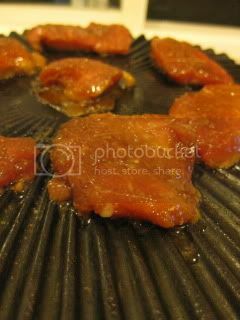 I heard that there is a very popular horse meat restaurant in Osaka, where Yaki Yaki San is set at every table and the customers cook different parts of horse meat on Yaki Yaki San...honestly, I want to go there! 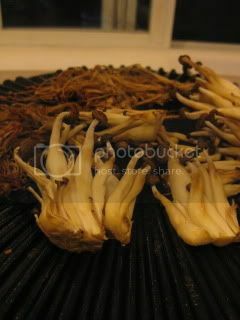 I tried grilling (1-day) sun-dried shimeji and enoki mushrooms on Yaki Yaki San, too. This was a recommendation by Nagatani-en (the producer of Yaki Yaki San) people. Wow, this was definitely different from grilling fresh mushrooms and I liked it so much! The texture of the grilled sun-dried mushrooms was so meaty and the more I bit the more I could taste the deep umami flavors. 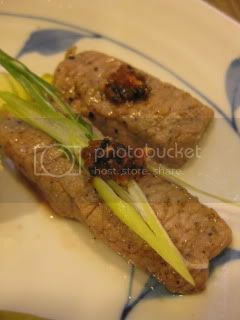 It was great with my homemade chunky la-yu. The last item for the grill was the marinated beef tri-tip. Just a couple of hours of marinade made the meat even more tender and it was super juicy. I made a wrap with nori seaweed. What a great grilling dinner without smoke. Yaki Yaki San is wonderful!